When Conestoga Mall first opened in 1978, it housed just three anchors: a Robinsons to the south, a K-Mart to the north, and a small Dominion grocery store to the east. Robinsons went bankrupt in the early 1990s and The Bay has opened in its place. K-Mart discontinued its operations in Canada and has since been taken over by Zellers. The Dominion location was converted to a Zehrs in the 1980s, and Zehrs later relocated to a new and larger location in the mall. In the previous grocery store space, Winners, Sport Chek, and other retailers opened in 1999. 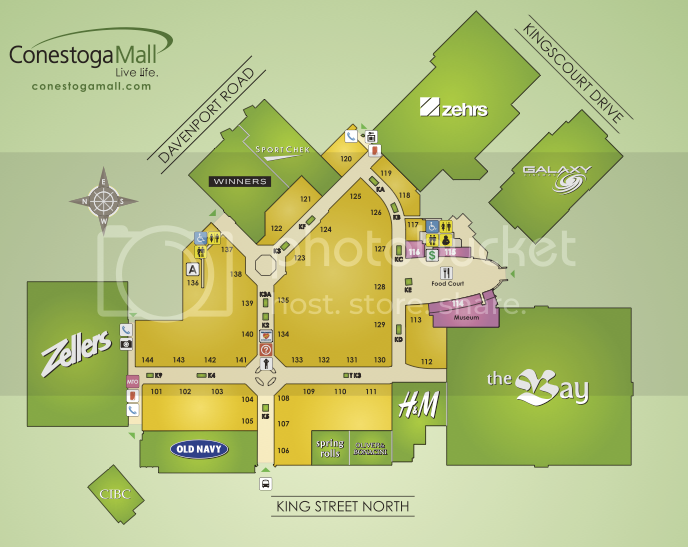 Conestoga Mall is a major shopping mall situated at 550 King Street North in Waterloo, Ontario, Canada. Located at King Street’s interchange with Highway 85 (Conestoga Parkway), it is the largest shopping centre in Waterloo, and third-largest in Waterloo Region. The mall is owned and operated by the shopping centre development company Ivanhoe Cambridge, which is a principal real estate subsidiary of Caisse de dépôt et placement du Québec. Current anchor tenants include The Bay, Zellers, Zehrs, Galaxy Cinemas, Winners, SportChek, and Old Navy. The mall, built in 1978, was one of the only buildings on this section of King Street. Since it opened, the mall has expanded several times, and has contributed to the retail success of this area. Several big box retailers, including Future Shop, The Home Depot, a large LCBO, and a BMW dealership have opened on King Street North around the mall. The mall is also one of Grand River Transit’s main transportation terminals in Waterloo Region. Conestoga Mall is recognized as one of the most environmentally conscious malls in Waterloo Region. Foremost, the mall supports green electricity, purchasing 30% of its common area electricity requirements from Bullfrog Power . Other environmental measures include using washable cloth towels in the mall washrooms, having many recycling facilities placed throughout the mall, and not using pesticides on the property grounds. Conestoga Mall has extended Christmas hours 9:30am-9:30pm. Open Christmas eve until 5:00pm.